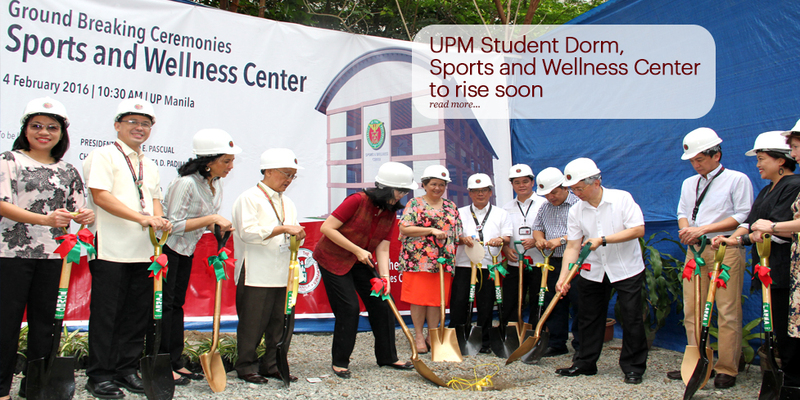 After 16 years, the UP Manila Sports and Wellness Center will start construction at the old Animal House beside the UPM College of Medicine Annex Building. The ground-breaking ceremonies for this facility and another building, the eight-story Student Dormitory, held on February 4, 2016, was led by UP President Alfredo Pascual, Chancellor Carmencita Padilla, in the presence of National Scientist and former UPM Chancellor Ernesto Domingo, the vice chancellors, deans, directors, faculty members, staff, and students. UP President Alfredo Pascual pointed out in his message that all of these projects are for the benefit of the students. He stated his vision of making UP a great university and achieving academic excellence will not be possible without the enabling conditions, such as the physical facilities in the campus. “We are doing this to make sure we remain the best academic institution in the country and eventually reclaim our rightful position as one of the great universities in the region and the rest of the world,” he stated. Chancellor Padilla recounted that the plan to make a twin-towers dormitory facility inside the campus for the students was made five years ago during the time of Chancellor Arcadio. “We wanted a palace but our budget was only for a house,” recalled Chancellor Padilla. After Chancellor Arcadio’s term, he left the funds for the gym but it was not enough and the project encountered failed biddings. “Safe, Sustainable and Student-friendly rates” were the three ‘S’ envisioned by the current administration with the construction of the eight story Student Dormitory. The construction is set to finish in 12 months. Vice Chancellor for Planning and Development Dr. Michael Tee said that on June 18, 2015, President Pascual approved the additional funds for the dorm while the bidding process took only one round. He already had a design then for a six-floor building but Chancellor Padilla insisted a high-rise building, and with the help of Eng. Glyceria Perez, the design for an eight-storey building was made. The plan for the gym, she recalled, was a longer story. It was during the term of former Chancellor Marita Reyes in 2000 that former CAS Dean Malou Nicholas’ passion to have a gym for students brought her to the US to raise funds for the gym but did not get enough money. Undaunted, Dean Nicholas did not stop there; she went to the chancellor and requested that half of the lot in the construction of the NIH building be alloted to the gym. With Chancellor Padilla and Arch. Jose Danilo Silvestre, Dean Nicholas went as far as designing the building but nothing further happened after. Further attempts were made for the construction of the gym. Chancellor Padilla, with the late former UPM Chancellor Perla Santos Ocampo, the late former Vice Chancellor for Planning and Development Dr. Alex De Leon, OSA Dean Reynaldo Imperial, former Vice Chancellor for Administration Dr. Napoleon Apolinario, and Dr. Isidro Sia met several times for the gym. When the site of the NIH was no longer available for the gym, it was proposed to be included in the planned construction of a high-rise building in Padre Faura Street but it also did not materialize until the time of Chancellor Ramon Arcadio that the current lot for the gym was assigned. “The dream that was planned way back in 2000 is finally happening 16 years later and we are happy that in six months, it is going to be a reality,” the UPM chancellor declared. The Sports and Wellness Center will be completed in 6 months which means that in August, the facility, designed by Arch. Mark Anthony Quinitio of the UPM Campus Planning, Maintenance and Development Office, will be in use. “My commitment to President Pascual is that during this administration, we will able to deliver what was promised not only by my term but by all chancellors before me,” Chancellor Padilla said. She emphasized that President Pascual is the main driver in the university and all of these projects will not happen without the support of the UP president.